Standing at the center of this artistic work is the performative element. Texts, images, live actions and a video construct intertwined performative levels. The performative action – a combination of word and dialog variations that I have taken from the commercials for the Sunday evening TV program featuring film adaptations of Rosamunde Pilcher’s dime novels at 8.00 p.m. on ORF2, put into the picture by a lay actress – was processed into a video and a further room installation. 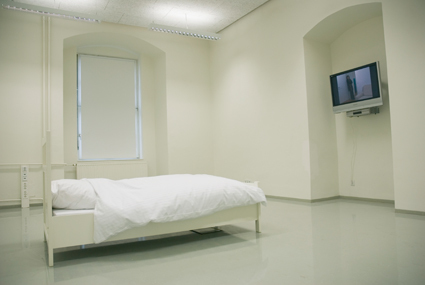 The room installation depicts a reduced living space: a TV and a bed. When a person moves into the immediate vicinity of the bed, a motion detector activates the video. When a person leaves the vicinity of the bed again, a freeze image is created.